Frisco, Texas (December 11, 2018) – FC Dallas midfielder Roland Lamah was selected by FC Cincinnati with the third pick in today’s MLS Expansion Draft. Lamah, 30, scored 19 goals and nine assists in 61 appearances with FC Dallas. 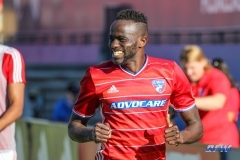 Signed with FC Dallas in 2016, Lamah scored the fastest hat trick in franchise history and second fastest in MLS history on June 3, 2017 in 30 minutes and 38 seconds against Real Salt Lake. His hat trick earned him Alcatel MLS Player of the Week honors for Week 14. In two seasons, Lamah had six multi-goal games in two seasons, tied for third in club history.